If you’re still reading, thank you. If you haven’t read Part 1 yet, read it here. So it was time for some serious troubleshooting. I have to admit that I jumbled the timeline just a little in Part 1, so as to come to a dramatic pause point that seemed plausible. The astute among you will have recognized that of course, with the engine not running (zero revs) there would be multiple error lights shown on the dash. Just like during every normal startup. And with the exception of the “Visit Workshop” message you would be right. Let me slow down and see if I reconstruct the chain of events. Spoiler warning: unintended consequences and brain farts are involved. So I came out on Saturday morning and tried to start the car, finding that I had a dead battery. The previous day I had started the car and only obtained a PASM warning message. The internet reassured me that this was normal after disconnecting the battery and that this message would clear with a little driving. When I found the dead battery I put the charger on it and went to consult with my wife about the age of the battery. The only recollection she had was that it was not the original battery and had thus been replaced once. This sort of held up, as the battery did not have any Porsche stickers on it. She was concerned about future battery failures and quizzed me closely on what I done to discharge her battery. I agreed it was a matter of concern to me also, as I would undoubtably pay for the rollback when disaster struck. Well, I didn’t exactly put it that way but I did put on my best “concerned face”. I told her I would do some tests. As with any good mechanic, the first test I decided to perform was a current draw. I hooked up my amp meter in series with the positive battery terminal. Sure enough, I was seeing about a 7 amp draw. Not good. The next ace mechanic move is to check for current draw while pulling one fuse at a time at the fuse panel. On the Cayman, the fuse panel isn’t quite as bad as an early 944 (can you say lay on your back in the driver’s side footwell?). It is down by the clutch on the side panel. I extended the leads on my meter to be with me in this somewhat awkward location. For reasons I cannot explain, no fuse seemed to be associated with the current draw. Damn! Somewhere in the process, I realized that every time a door was open, there were courtesy lights blazing. I went back to the original setup with my test meter in the front compartment. After all the doors had been closed and 2 minutes expired, the current draw dropped to about 2 amps. Still not great but progress. 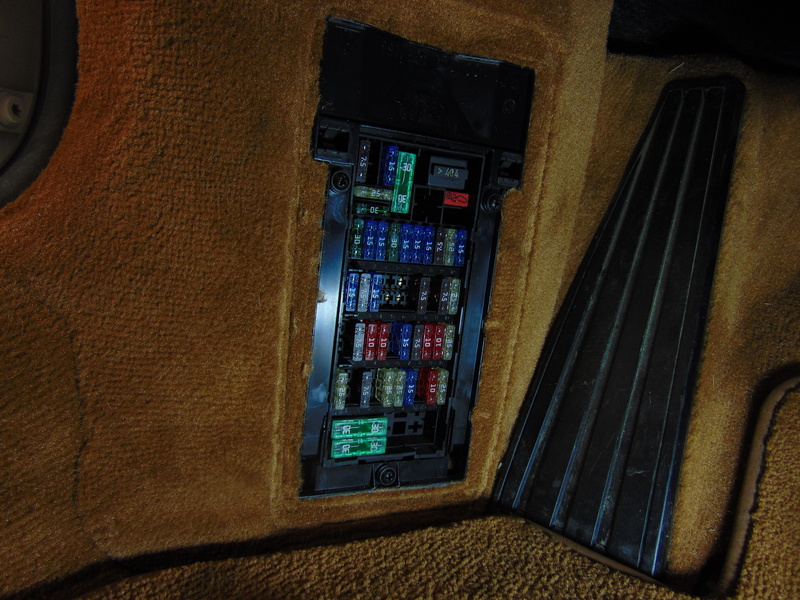 I pulled the meter outside the front compartment and firmly closed the front hood. Presto, a reading of 0.01 amps. Victory! I dragged in the jumper cables from the trusty F150 and got the Porsche running. It was at this point that I was presented with the light show. I was panicking. In my mind, there was only one thing left. Drive it and see if the lights cleared. Alas, no joy. No lights cleared and to boot, the speedometer was dead! Well, at least a dead speedometer was a clue to pursue. At about this point, my wife popped in and asked me how it was going. “Well, the engine starts fine and runs up and down our street with no problems. There are a few dash lights that won’t clear.” Ah, yes. I got the “look of scorn”. “So what did you screw up?” she asked, using the tone of voice she reserves for veterinary students who have just lost their patient on the operating table. But I have to admit, she was right on. What did I screw up? There are rarely coincidences in the world of car repair. No speedometer. That must mean wheel speed sensors. ABS failure. Same prognosis. Brakes no good. Could also be the same. And I had disconnected the weatherpack connection for the brake pad thickness that shared the same plug-in as the wheel speed sensors. Up on the lift. Off with the tires. The connectors looked OK but just in case I pulled the connector and cleaned the contacts with Deoxit. Deoxit is a staple of 80’s Porsche electrical repair. Buy multiple cans. That said, these connectors were pristine, only being 9 years old. Whatever, need to rule this out. Wheels back on. Road test. Damn! No speedo. Just for grins, I pulled the back wheels and checked those connections to, on the premise that my sparkplug work had inadvertently disturbed a connection. Wheels off. Clean. Wheels on. Test drive. No joy! Back to the internet for inspiration. 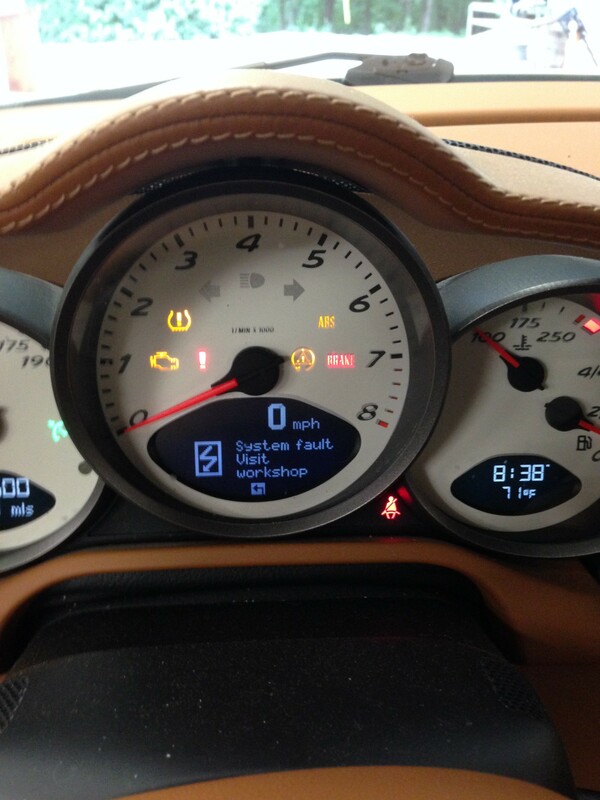 A post suggested that low brake fluid would trigger a similar warning light on the dash. Yes! I had to pump the pedal several times to get the retracted disc brake pads out to their proper position. This action draws fluid out of the master cylinder reservoir that is not returned. That must be it. I pulled the cap on the reservoir and was able to add some fluid. Ignition key on. Damn! So, come on Ferris. The fault is occurring just by turning on the ignition. The car is pissed off even before you start it up and drive it. It must be something pretty elemental, eh Watson? Social obligations intervened and I had to dog off for Saturday. I will tell you that I didn’t sleep too well that night, pondering this problem. What was left? Had the brake fluid bleeding process upset the ABS unit? The internet had no such reports. I did find a comprehensive article about how to use Porsche test meter ump-tee-squat to test the ABS on a 928. Oh lord, deliver me from Porsche special test rigs! How about those fuses? They had been temporarily disturbed from their 9 year slumber in the fuse panel. On an 80’s Porsche, corrosion at the fuse/relay panel would be job one for any weird electrical problem. (See 928 CEL refurb article here). Fortunately, I had snapped a photo of the fuse panel before I starting pulling fuses. Remember, a digital camera is your friend. I loaded up said photo on my laptop so I could see it. I also found a fuse chart on the internet. I started going through the fuse layout looking for problems. I’ll be damn, there is one fuse that was mis-positioned. Cue brain fart music! Even better, per the fuse chart, this fuse was associated with the PASM system, which uses the wheel speed sensors to do its thing. I had found the problem! Confident in my diagnostic prowess, I turned the ignition key. Nooooo! Still a light show. I have to admit I was pretty beat up at that point. As a last gasp, I scanned the fuses for any other mis-positioning. Everything looked good. While scanning the fuse chart, I noticed that there are actually 2 fuses associated with the PASM (Strangely, the acronym ABS does not show up on the fuse chart). I decided to pull the other PASM related fuse and test it. It tested good. I cleaned it with Deoxit and re-installed it. Turned the key. No freakin’ way! All the ABS and brake lights were cleared. No System Fault. Man, I am telling you, I started to do my major happy dance around the shop! Not trusting my good fortune, I went out for a quick drive. Speedometer is working. No fault lights. Yes, there is a God! So it’s 3 days later. What happened? I called Leith Porsche on Monday. Yes, the battery had been replaced in 2009. It was 6 years old. Maybe on its last legs? What caused the battery to go dead? The hood was not fully latched. I can’t be sure but I suspect the combination of the hood compartment light being on overnight combined with a weak battery caused it to draw down. There is even a chance that one of the doors was not shut, causing a 7 amp current drain. Brain fart- in my efforts to troubleshoot the battery, I mis-positioned a fuse. Not hard to do in such an awkward position but still, shame on me. But I put the fuse back and the car still showed system faults. A mate at work came up with the most plausible suggestion. The second PASM fuse that I pulled to clean and inspect temporarily de-powered the PASM brain, allowing it to re-boot and clear its fault codes. It makes sense given the circumstances. Wow! So we have the unfortunate battery discharge, followed by the unintended consequences of searching for the problem, followed by the brain fart of the misplaced fuse, followed by the obfuscation of 2 fuses related to the PASM, intermixed with the cars dislike of ever being totally down powered. And did I mention schedule pressure? It’s amazing that we don’t have space shuttles blowing up more often. It can be a complex technological world that we live in. Whatever, I glad to have the car running and back in good form. I’ll never disconnect the battery from a modern Porsche without hooking up an alternate 12V supply first. Post Script: That was a fun article to write and was interesting drama to say the least. But what about Cayman maintenance for the DYI person. Doable? Well, certainly up to the point of my self-induced electrical problem, I think the maintenance part went quite well. As I pointed out, the internet was invaluable in its assistance. We all know there is the good and bad on the internet so everything I use there is tempered with some judgement. Common sense is always required. If I’m going to keep at this, I will almost certainly purchase an AllDataDIY subscription for the car. I have used this downloadable service to obtain shop manuals for other cars and it is very cost effective (currently $30 for 5 years). I own the book 101 Projects for Your Boxster from Pelican and think it is a worthwhile resource that has tentacles to Cayman maintenance. Actually, the entire series of 101 Projects books by Wayne Dempsey are very well written and worthwhile guides to maintenance, especially for the NOOB. Porsche uses an expensive tool they call PIWIS to manage the electrical and software aspects of the car. I understand it is totally out of the price range of a DIY guy. After my recent experience, I am looking strongly at the Durametrics device, which is a few hundred dollars. I’m not kidding myself, I’m sure it can’t do nearly as much as PIWIS but their advertising blurb sounds promising. I will have to say that after 60,000 miles and 9 years, our Cayman has been dead nuts reliable. We did learn early on to never let the battery get low, which resulted in the “tow of shame” once early in it’s life before I understood that the car can be driven with all those warning lights blazing, again using common sense and understanding that some lights are more dire than others. Check engine light- motor on. Oil pressure light- shut down immediately and call for a tow. I own a lifetime’s accumulation of tools and there were items in my collection beyond the standard set. First, everyone should go out and buy the largest Craftsman automotive assortment they can afford. On a per tool basis it is an incredible value and it will all fit in a large tool box. Although my lift is wonderful, I went for years using a jack and jackstands. Buy good quality jackstands. Your life depends on them. Beyond the basic handtools, a set of ratchet driven allen head sockets is mandatory as well as a set of torx drive sockets. I haven’t run into any “cheesehead” or “triplepoint” fasteners yet (they may be more common on the 80’s cars) but a set of these is a good idea. Access to the front spark plugs is pretty restrictive. I used a variety of extensions and flex joints. The brake pads only required pliers, a drift, and a hammer. I use big “channel lock” pliers to retract the pads. The serpentine belt required a rather large socket (22 mm?) but that should have come with your big Craftsman tool set. The tool that fits over the end of the oil filter housing to allow removal with a ratchet is helpful, although I suspect a strap wrench would have worked. And a torque wrench for the plugs, although I’ve been torquing them by feel for years. I love my Motive Products pressure bleeder for flushing brake fluid. All in all, not too bad. Wayne Dempsey’s books do a good job of listing tools required for the various jobs. In summary, the basic tune-up items that I performed got done with little drama until I killed the battery. I’d be up for more but as I’ve said, I don’t expect much maintenance action on the Cayman because it is such a well built car. When things do crop up, I suspect they’ll be in the genre of electrical items in the cabin not working properly. Now that is a whole nother ballgame and may indeed be beyond the ability of the average DIY guy. We’ll see. I taught myself to work on Bosch electronic fuel injection back in the 80’s when it was scary territory. Now it seems like old hat. I’m working my way toward knowing my way around a 928 electrical system. A steep learning curve but I do say, the Germans produce one hell of a nice set of electrical diagrams. In conclusion, these are fine cars. We love them. We like to drive them. Some maintenance is required. Tackle it. The money you save can and will buy a lot of fun at your next HPDE!